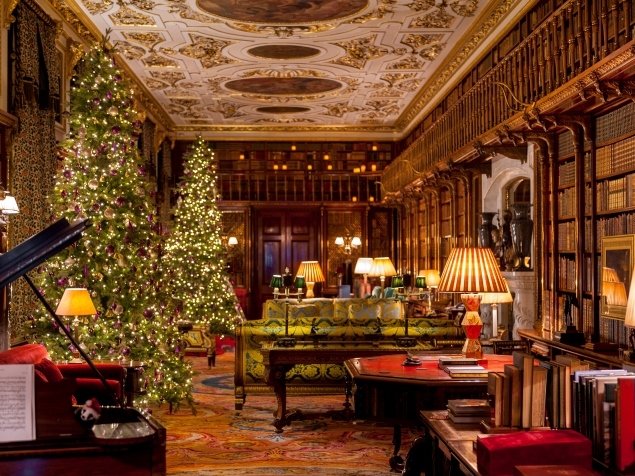 Is there nothing more cozy and cheery than a warm, bright library at Christmastime? The Biltmore House photo below inspired this entire post, which is purely eye-candy for book lovers at Christmastime! If you’re snowed in, grab a warm cup of tea and take comfort in these cozy, Christmas-ready libraries. Can we just all gasp and take a minute to catch our breath, please? The Biltmore House and Gardens located in Asheville, North Carolina was featured The Southern Hospitality blog two Decembers ago, and the effect has definitely not lost it’s charm. Visit their lovely site here! 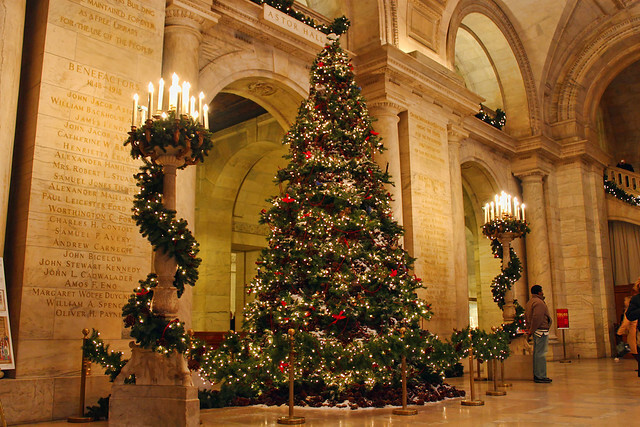 This giant tree and matching lighted garland makes the NYPL look so friendly, warm and inviting. Imagine entering with a steaming thermos of hot chocolate, fresh novels in hand! This stunning photograph from the Library of Congress in Washington D.C. has no books, and yet, still manages to make me feel smarter and more distinguished! According to their website, they even have reading rooms organized by subject, language and format. Would love to visit here at Christmastime someday. This library from the home of Governor Roy and Marie Barnes of Georgia (2012) is featured on Between Naps on the Porch. I think my favorite thing about this library is it’s order. Those rows and rows of gold and red tomes, the perfect row of stockings, the symmetrical chairs…I feel relaxed just looking! 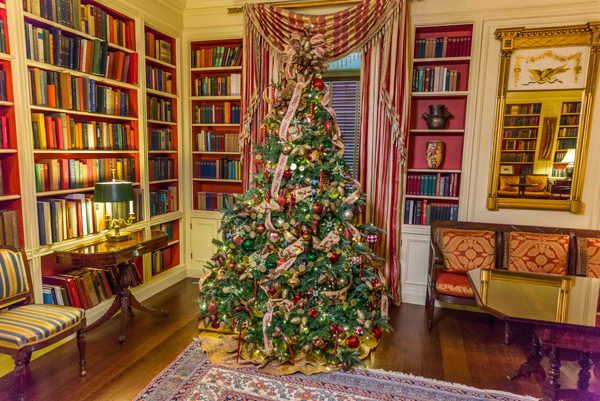 The presidential family in 2013 celebrated the holidays with a theme: “Gather Around.” Both grand and fun, this library’s bright red shelving and whimsical Christmas touches on the tree certainly make one feel right at home. I’d love to pull a novel off the shelf and stay a while! 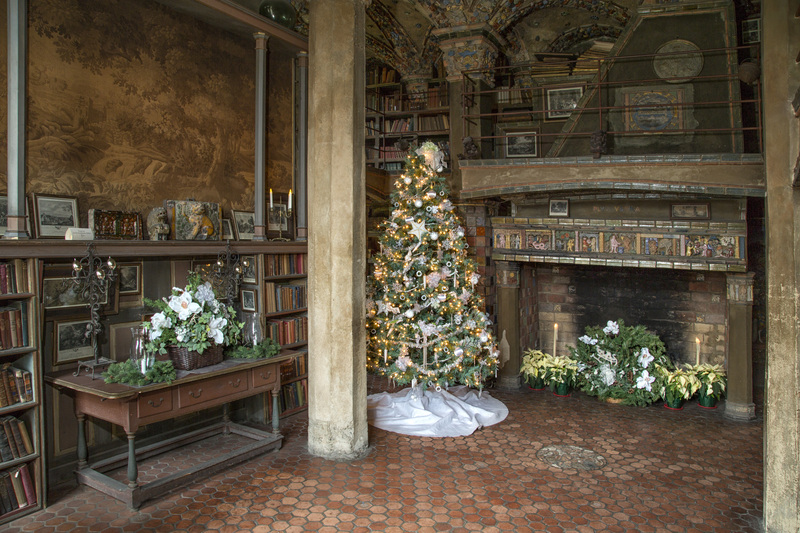 The Fonthill Castle in Doylestown, Pennslyvania boasts a large, antique looking library with stately columns, and looks fabulous dressed with poinsettias and a white-trimmed tree and wreath! Sadly, I couldn’t find the location of this lovely Scottish-themed home library! 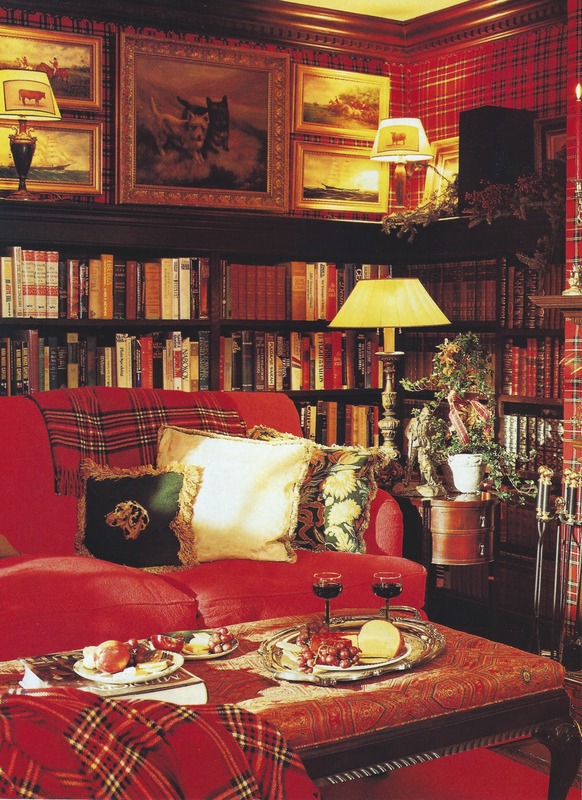 Decked in plaid, Scottie dogs, and rich, comfy fabrics, it looks perfect for a cozy book-browsing session. This beautiful, sprawling mansion-turned hotel located near Buckinghamshire in England has several cottages on its huge estate. I found this gorgeous library photo on the Sustainable Restaurant Association’s article boasting the hotel’s fine dining. Fine dining or not, I’d love to hole up in one of Cliveden’s libraries! The Newport Mansions in Rhode Island have room after room of breathtaking holiday glitz, including this lovely gilded library, complete with chandelier style sconces, glass encased bookshelves and of course, a lavishly decorated Christmas tree. If you can’t get enough of these photos, steal some of these ideas from Book Bub to create your own home library! When the holidays draw near, there really is no place like home.